What is it about the bad boys? SERIOUSLY. In my review of Shatter Me, I said that I hadn’t really picked a team in this series. That I felt that both Warner and Adam had their positives and their negatives, and I should give myself time. Yeah, well, the time was reading Destroy Me, and the team is Warner. I like Adam, I really do. Throughout Shatter Me, I felt myself leaning towards his quiet protectiveness, and his dedication. Yes, there was more swooning for Warner, but he was kind of a psycho. And then I read Destroy Me. And all of that kind of hit the fan. In Destroy Me, it is amazing how clear and succinct Mafi’s writing is. After reading hundreds of pages of flowery prose and excessive comparisons, it’s kind of hard to believe that the same author wrote the words in Destroy Me. They are perfectly aligned with their characters. Shatter Me is reminiscent of Juliette and all the trials and tribulations she has been through in her short life – the confusion she feels at every corner. And Destroy Me is so representative of Warner and his strict and ruthless upbringing. Now I know that a crappy upbringing is in no way a reason or excuse to be a kind of psycho like Warner, but in Destroy Me, you get to see inside his head. You get to see his reasoning behind the things he did. He didn’t just shoot a man, and he didn’t allude to killing a toddler for Juliette to use her powers. He did it for good reasons, no matter how messed up they may be. And the way he feels for Juliette is just heartbreaking. You get to see his emotions so much more clearly than you did in Shatter Me. You get to know Warner so much better. He’s not just a ruthless guy waiting for his rise to power. He’s a young man who has been abused and tortured, and is trying his best. I think Destroy Me has made a Warner fan from me, that is for sure. I have only ever written one novella review other than this one, because I simply feel like not enough can happen for me to write about. Usually, they are just fillers, and nothing happens in way of storyline or opening doors to rooms we haven’t seen yet. 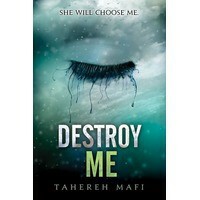 But Destroy Me goes against the grain and introduces you to a whole other side of a character, and shows development, as well. A brilliant novella, in my opinion. I highly suggest reading it, if you have not already.